We Clean Up What Plumbing Leaves Behind. We cleanup what plumbing clogs like this leave behind. As this root system grew, it clogged the main drain from the house. That clog is only a little part of the trouble. What happens to the water that can’t get through a drain like this? It floods a house out. Walls, carpet and customers contents get wet and need to be cleaned up, dried out and taken care of properly. When it comes to contaminated water sources like septic and sewer backups, you need to find a company that knows what they are doing, has trained technicians who follow industry standards to make sure that your home is not just cleaned up but is returned to a safe environment. 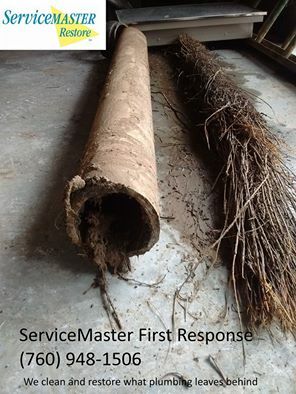 That is where ServiceMaster First Response comes in. Our staff knows just what to do. They will explain to you what needs to be done, how we can do it and give you the peace of mind to know it will be done right. If you have a slow drain, call a plumber quickly to avoid a flood. if you have a flood, call ServiceMaster. We can get your home back to the beautiful safe environment that it should be. You have the choice of who you want to use to handle a flood. You can count on us. Why Choose ServiceMaster First Resonse?